From 1956 until 1957, Elvis and his family lived at 1034 Audubon Drive in Memphis. It wasn't long, however, before it became apparent that the Presleys needed more privacy and security than the Audubon Drive home could provide. So in 1957, Elvis bought Graceland for $102,000 from Ruth Brown Moore. Graceland was Elvis' final home in Memphis and it is where he died in 1977. Now Graceland is the second most visited residential property in the United States after the White House. Visitors to Graceland will experience more than just a tour of Elvis Presley's mansion. There are many other must-see exhibits to enjoy. Here is an overview of all you'll find at Graceland. 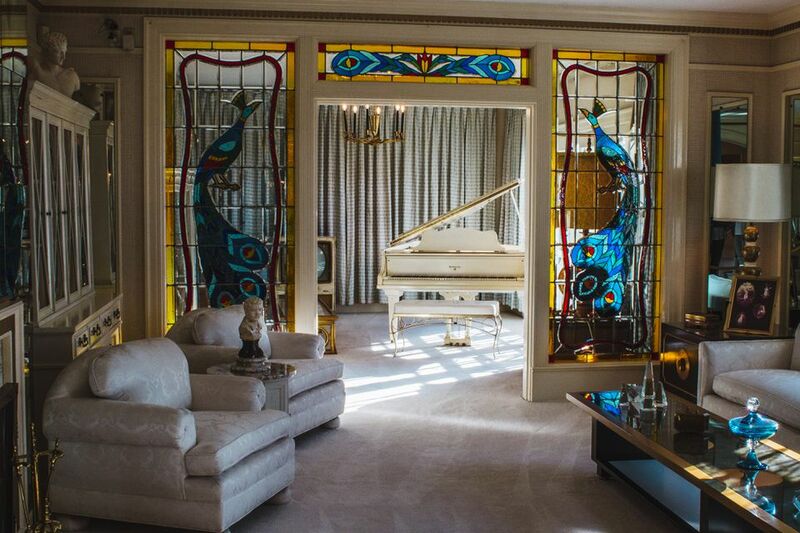 An iPad tour takes you through Elvis Presley's main house, the mansion. The tour is narrated by John Stamos and takes you through the living room, the music room, Elvis' parents bedroom, the dining room, kitchen, TV room, pool room, the famous Jungle Room, and more. After leaving the mansion visitors are taken to the racquetball building where Elvis worked out, his business office where he made his deals, and the trophy rooms which shows his numerous awards. The mansion tour ends with a visit to the Meditation Garden where Elvis, Gladys, Vernon, and Minnie Mae Presley are all buried. Elvis' Automobile Museum houses 22 vehicles that Elvis drove or rode in during his life. On the tour you can see his famous 1955 pink Cadillac, 1973 Stutz Blackhawk, and his Harley-Davidson motorcycles. In addition to these retro vehicles, the museum is home to two Elvis-themed race cars: an Elvis NASCAR that was driven by racing star Rusty Wallace and an Elvis NHRA car that was driven by John Force. There is also the Highway 51 Drive-in theater where you can sit back and watch a film about the King. While at Graceland, visitors are invited to tour Elvis' custom jets. The tour begins in a mock retro airport terminal where a video history of the airplanes is shown. After that visitors are allowed to step aboard Elvis' two airplanes: the Houndog II and his larger and more famous jet, the Lisa Marie. The latter, named after his daughter, even has a living room and bedroom. Photography Exhibit, "I Shot Elvis"
The Graceland Archives contain thousands of items, artifacts, video footage, and photographs that showcase the life and times of Elvis Presley. Many of these items are available for viewing in the Graceland Archives exhibit and The I Shot Elvis exhibit, which opened in 2015. The latter tells the story of Elvis' rise to stardom from the perspective of the many photographers that followed his life and career. Elvis’ Hawaii: Concerts, Movies and More! As part of the Platinum and VIP Tour option, you can see a special exhibit dedicated to Elvis' love of Hawaii. This special museum feature includes rare video of Elvis, jumpsuits and costumes he performed in in Hawaii, and color video of the first concert he ever performed in Hawaii. After your tour of Graceland head to The Guesthouse at Graceland, a four-star hotel on the grounds that is Elvis Presley themed. You can eat a peanut butter and banana sandwich (The King's favorite) at the deli, drink cocktails named after his songs, and sit around heart-shaped bonfires. Hours of operation varies by season. Visit Graceland's website for further details. Admission to the mansion and grounds starts at $41 for adults, $36.90 for seniors 62 and older, youth ages 13 - 18, and students. Children 7 - 12, $21.00. Children 6 and under get in free.